Are the Campgrounds Inside Yosemite Full? That's okay. Camping outside the Park has its benefits. My husband and I visited Yosemite National Park for a week at the end of March and, while the campgrounds that were open inside the Park at that time of year were full (reserved) well before our trip, we had an entire, albeit small, campground all to ourselves near Yosemite's west entrance. As a bonus, we camped right next to the beautiful Merced River. We were also happy to find that it was warmer at our campsite than it was at the higher-altitude campgrounds within Yosemite Valley, where there was a dusting of snow early in the week. Here is some information about camping outside Yosemite Valley, specifically at Dirt Flat and Dry Gulch Campgrounds, and some photos of the area we took while we were there. We were getting close to the entrance of Yosemite, so we knew our camping destination was even closer. Then we saw the left turn off of highway 140 at the Red Bud Picnic Area. 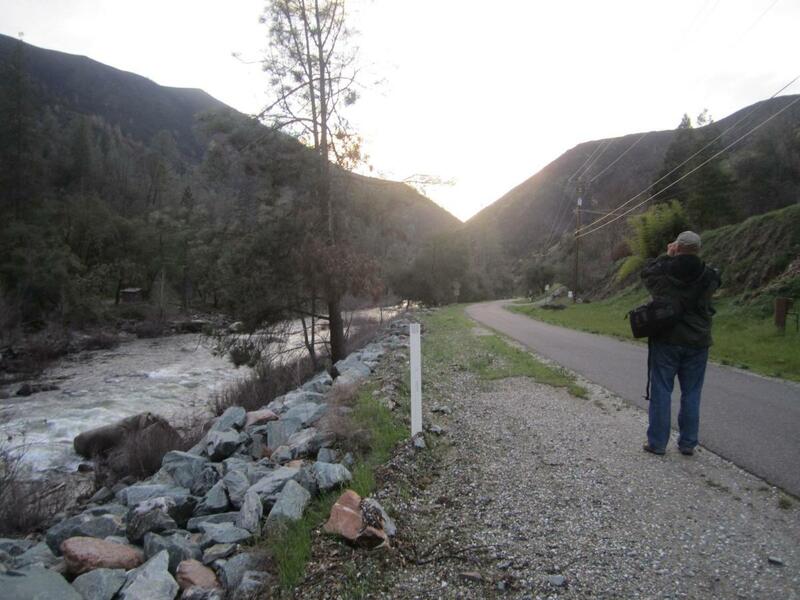 We crossed the bridge over the swiftly flowing Merced River and turned left on Incline Road, barely wide enough for two vehicles (and sometimes not, so there were pull-outs). Passing unoccupied Dry Gulch Campground, we drove another 1.5 miles to Dirt Flat. No one was home there either. 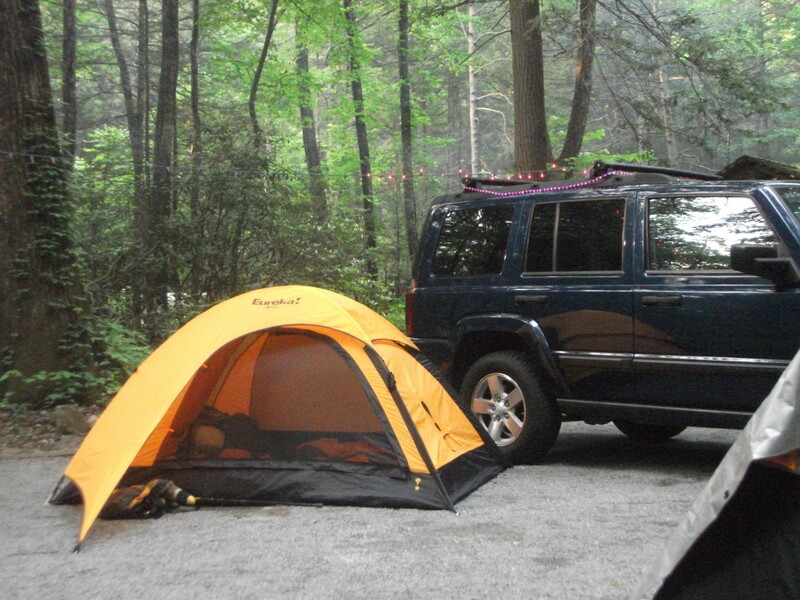 And that's how it was the whole week -- no one else camped at either campground but us. 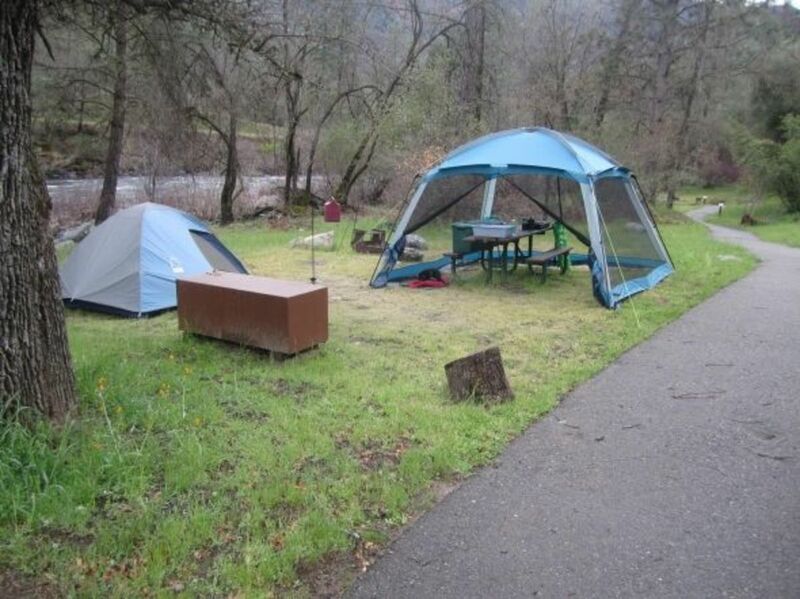 But even if they had, it was a beautiful spot with plenty of room for tents, shade- and rain shelters (like ours pictured here, over the picnic table), and camp chairs to relax in while watching the Merced water go by and the campfire flames flicker into the night. Across the river, vehicles passed on Highway 140, coming and going from the Park and a nearby lodge, but they were far enough away that the headlights and the sound, the latter largely drowned out by the Merced, didn't bother us at all. Behind and up-slope of our campsite, an occasional vehicle passed on Incline Rd, heading to or from several homes further up the road, but that wasn't a bother, either. In fact, we enjoyed evening walks with our dog along that mostly quiet road, as we enjoyed strolling along the former railroad bed and the wildflowers blooming up the steep hillside. We saw our share of wildlife here, including ducks and other birds, a deep red Yosemite salamander and even a bobcat. Each day but one, when we decided to stay and relax in camp, we'd drive just a few minutes up the road to the National Park entrance and enjoy another day in Yosemite Valley, where it was noticeably cooler than back at camp. Being early spring, we experienced everything from winter to summer conditions in that one week, with cool to cold nights. Walking past the full campgrounds inside the Park, even during the warmest part of the warmest day of the week, we noted how chilly it was in the shade of the sequoias. In the evening, we'd return to our warmer campsite, sometimes with a wave from the friendly Sequoia National Forest ranger who'd stopped by to greet us on our first day, give us his wisdom on the area, warn us to keep our food in the bear-proof locker at our site due to recent bear activity in the area, and chat for a while. He also told us about the cause of the recent fire, the evidence of which was all too clear on the slopes around us: A passing RV had caught fire and set the forest ablaze. Despite the fire, the area around Dirt Flat and Dry Gulch campgrounds is just beautiful and a wonderful alternative to tent-camping inside the Park. No RVs are permitted here, however. And you won't save much--if any--money by camping at either of these sites, which were $21 per night while we were there. 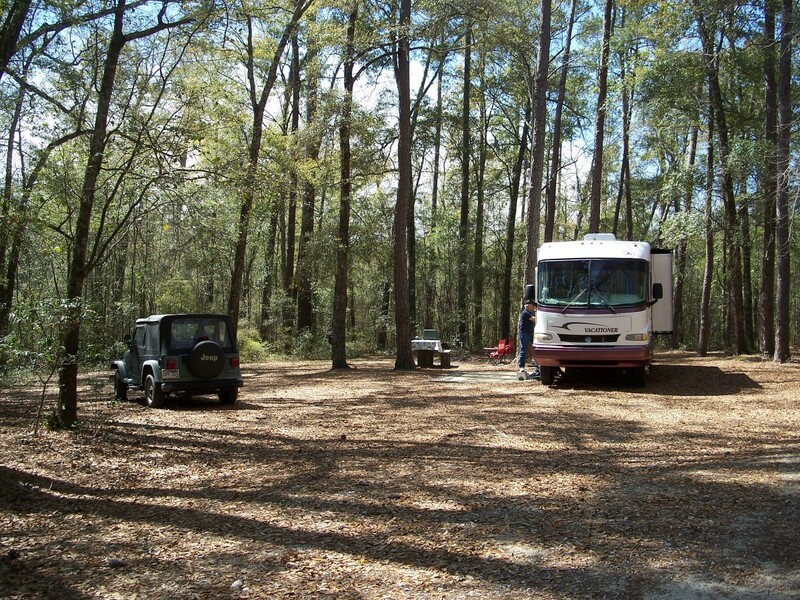 (Additional vehicles per site are $5 extra, and there's an extra charge on holidays.) 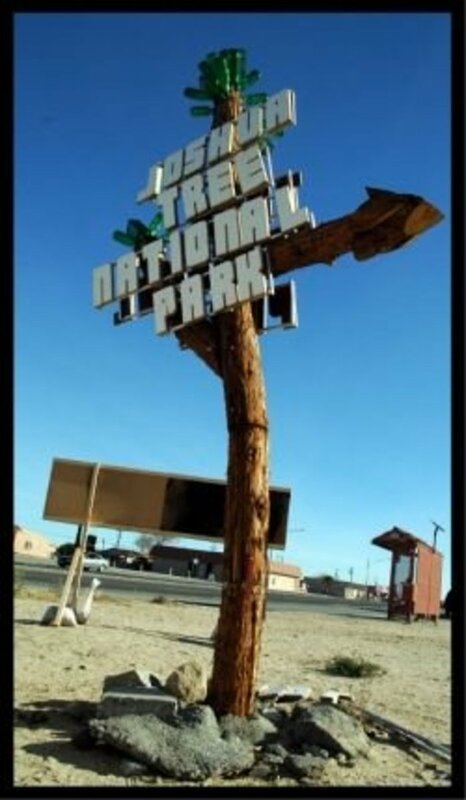 I'm quite sure these sites, like others near the Park, also fill up well in advance at certain times of year, so don't hesitate to make your reservations. We enjoyed evening walks on Incline Road, which runs by Dirt Flat and Dry Gulch Campgrounds, along the old railroad bed. 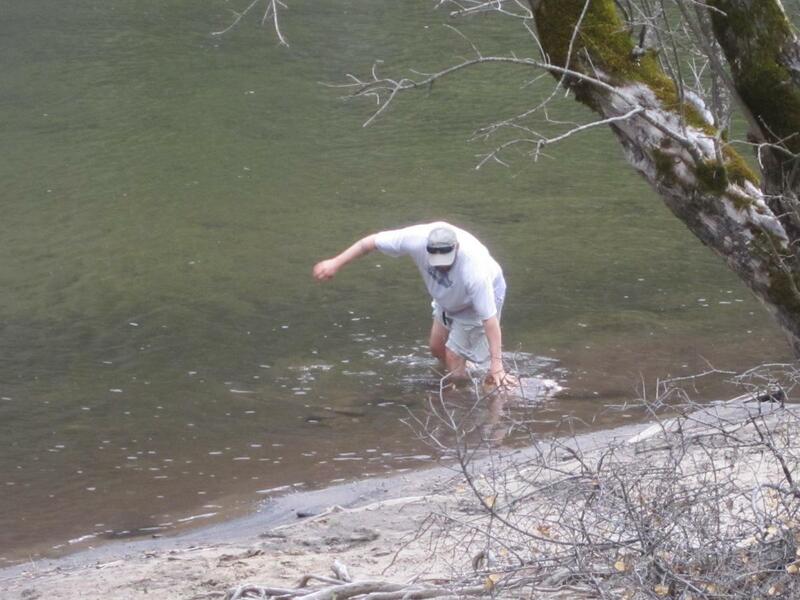 Jeremy takes a dip in the Merced River by our campsite. There's a sandy "beach" at the nearby day-use area. Jer takes a dip in the Merced River by our campsite. There's a sandy "beach" at the nearby day-use area. 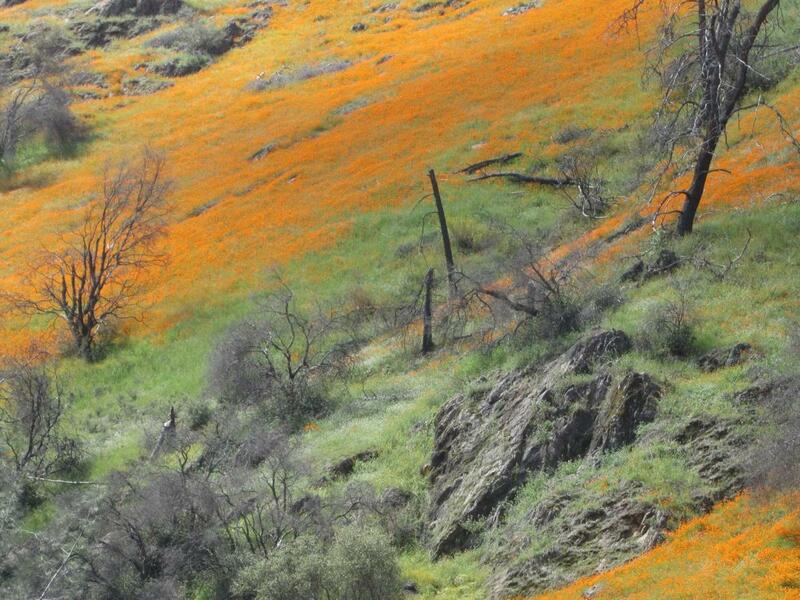 Poppies were blooming on the hillsides above our campsite outside of Yosemite Valley. If you're camping near or inside the Park, I'd go as prepared as possible with all or most of the supplies you'll need for your stay. There a few general stores with groceries and other items and an outdoor sport shop inside the Park at Yosemite Village, but, as you might expect, prices are high. There's a pretty big selection of foodstuffs available, though, should you forget or run out of something or just want a treat. There's also a small store -- the El Portal Market -- with a deli on Highway 140, close to the campgrounds on Incline Road, between there and the Park entrance. Again, not cheap, but they have plenty and know what visitors to the Park usually need. When we were there, it looked like new gasoline tanks were being installed at the then-closed station next to the store. So that station is probably open now. But, again as you'd expect, the cost of gasoline will be high there. In March, 2012, the closest gas to the campground was about 18 miles away in El Portal. Here's more information about where to get gas in Yosemite from YosemiteBlog.com. Just like Dirt Flat Campground, you'll pass by these tent sites first, on your way to Dirt Flat. Includes many campgrounds around the Park, near its various entrances, not just Yosemite Valley. 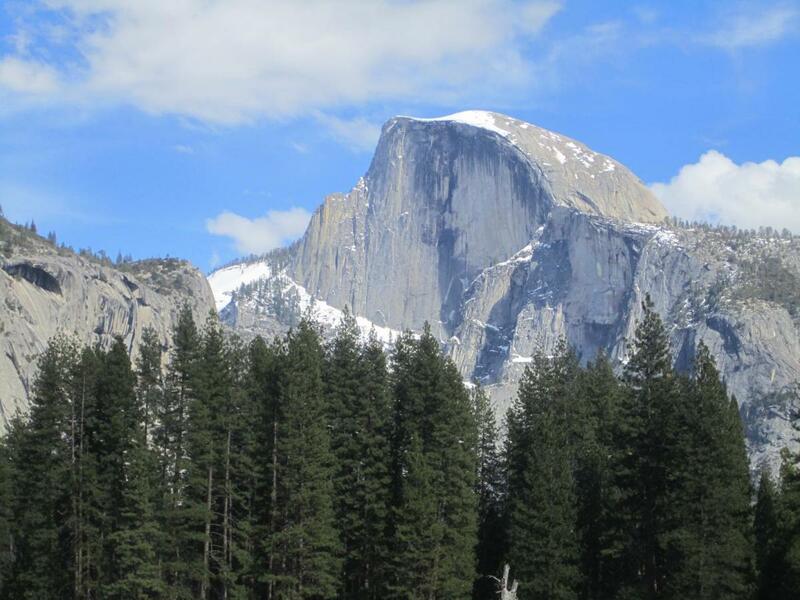 This comprehensive guide includes current travel information (including the new rules for hiking Half Dome), chapters on geology, ecology, wildlife, and the history of the area. This guide, an enjoyable read, tells the story behind the incredible scenery of Yosemite, from the many waterfalls to the High Sierra, Yosemite. 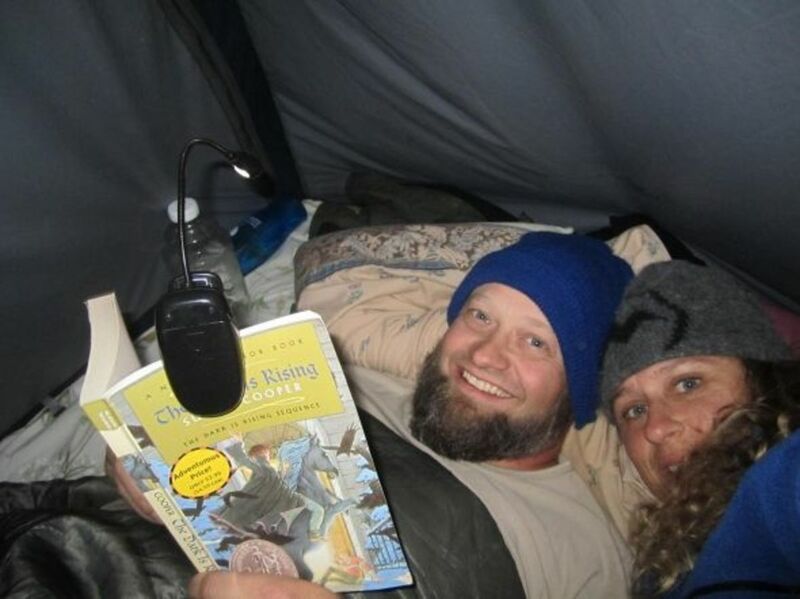 This is also a practical traveler's guide, with in-depth information on lodging, camping, and dining as well as outdoor activities such as hiking, biking, rock climbing, rafting, and skiing. 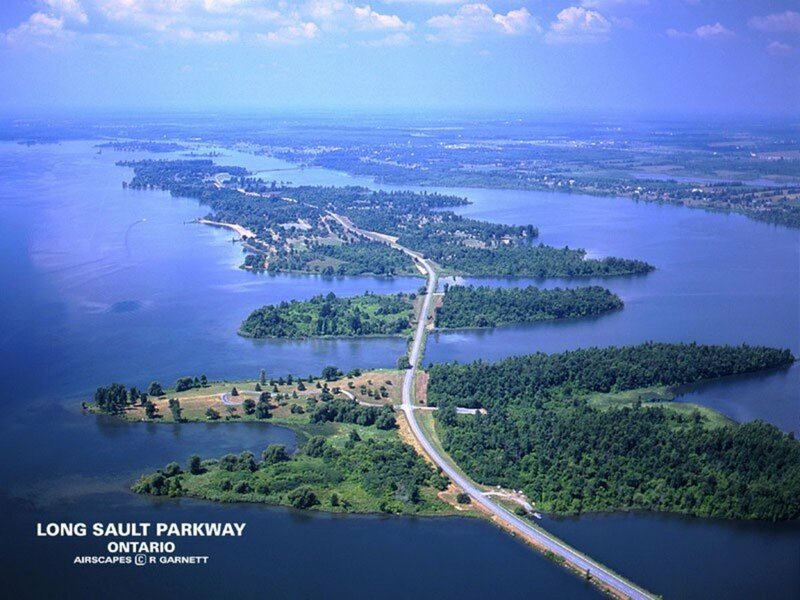 You'll also find details about transportation issues and seasonal weather patterns. More than 20 hikes are listed, with trail descriptions, topographical maps, and photos. Save and cover the whole Park and it's perimeter areas by buying the bundle. Need a National Park Pass? You can pay $30 at the gate for a 7-day pass just for Yosemite and go in and out as often as you like, or you can visit the U.S. National Park Service website to purchase an unlimited pass good at all National Parks, Monuments, and Recreation Areas for a full year. 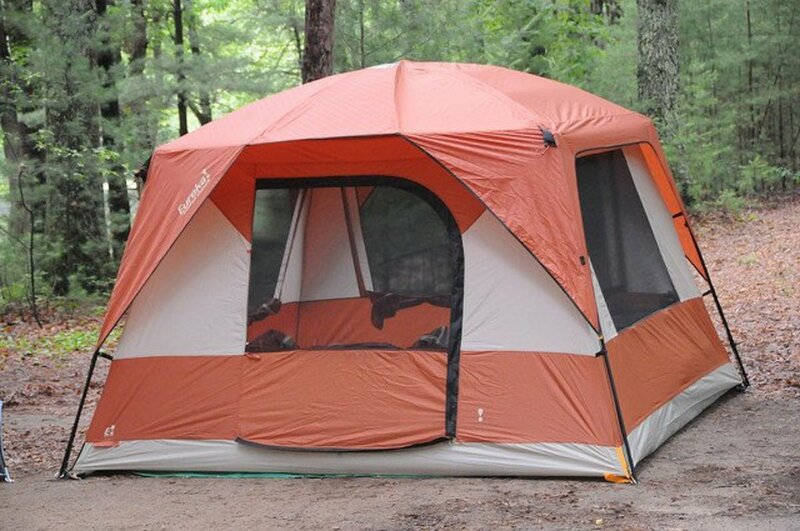 How many tents do you think we can fit into one site just outside of Yosemite? Camping for the First Time: What Basics Do You Need? 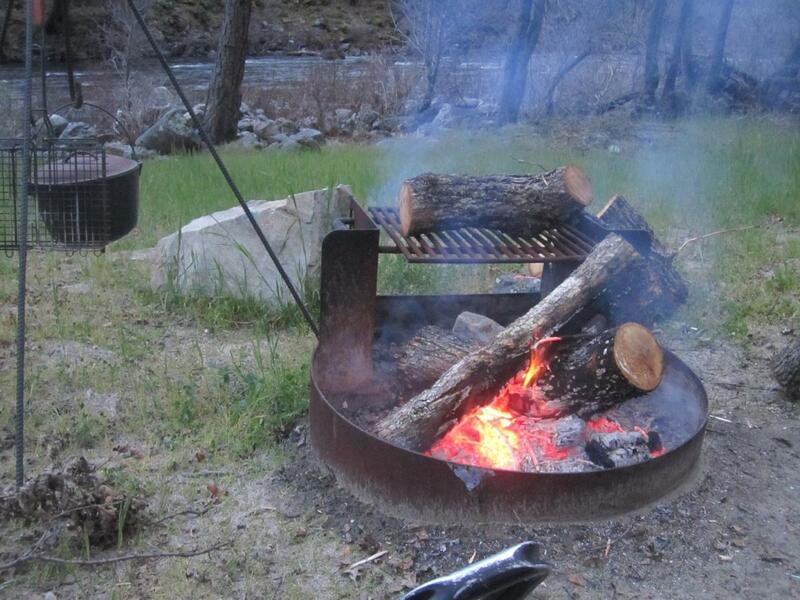 Tell Us About Your Yosemite Camping Experience. 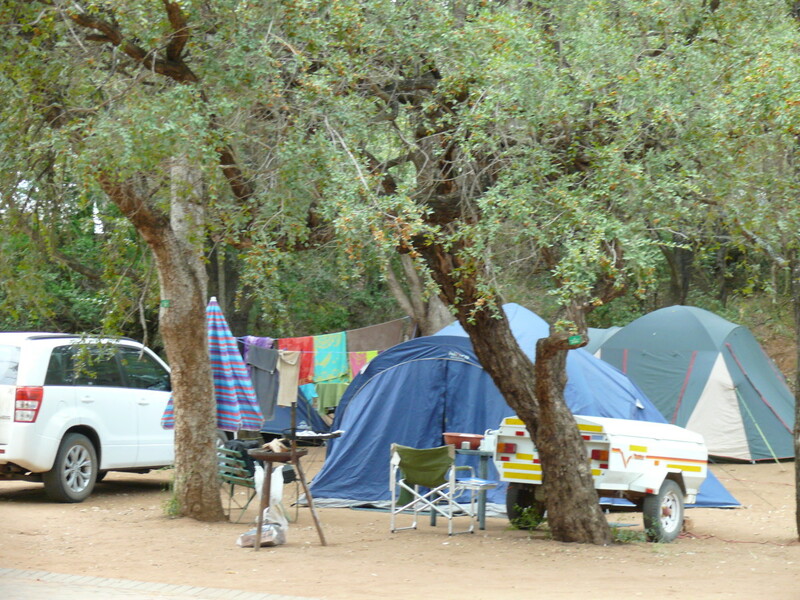 Or are you planning to camp in or near the Park? I am a professional outdoor guide (mostly climbing). 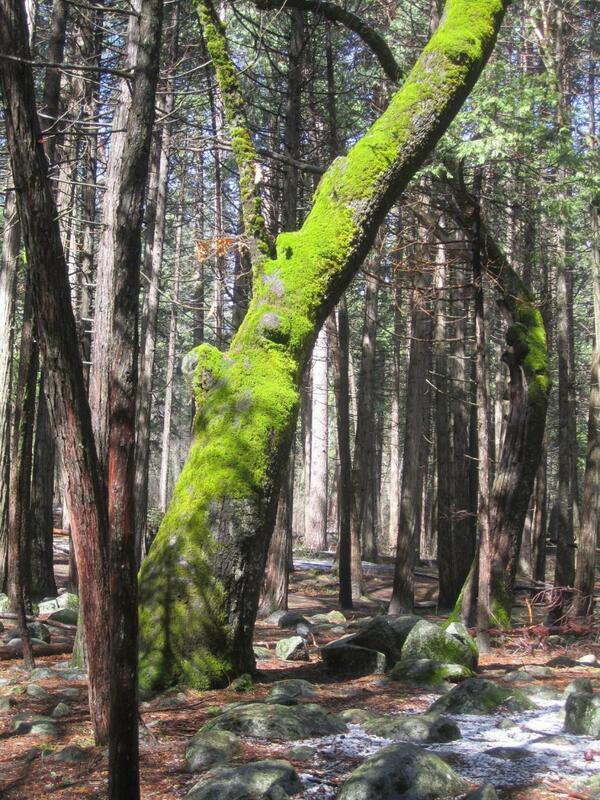 I camped in and around Yosemite literally hundreds of times over the last 35 years. 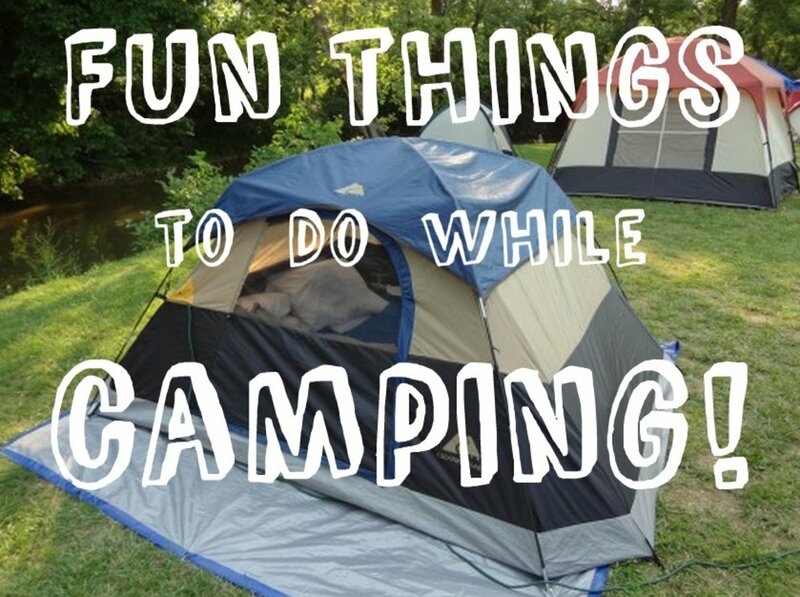 You have some great suggestions, especially since The Valley's campsites fill up sooo quickly every year. Thanks for the lens. I've camped at Yosemite once. It was really fun and there is nothing like waking up surrounded by such beauty. I'm driving up next week for my dad's birthday, but will be staying in the village on a soft, comfortable mattress this time. I have visited Yosemite but not camped there yet. What a beautiful place. We ran into an early snowstorm when we camped there in 1991, and couldn't continue straight east as we had planned because the pass was closed! I remember last year when my friends and I tried to camp at Yosemite National Park, and we ended up having to camp on the outskirts of it. I was expecting it to be a disaster, but it was one of the best trips weâve had to date! I brought along a Tailgater that I bought from Dish, and we watched the Sunday Game in HD that afternoon in HD while we were barbequing. When I returned to work at Dish, I was already planning the next trip to the same area. I canât wait to head there this year! Lovely place. Must be a unique experience.